Glutimax Buttocks Enhancement Ingredients: Stabilized Aloe Vera Gel, Water, Octyl Palmitate, Black Cohosh Extract, Damiana Extract, Calendula Extract, Saw Palmetto Extract, Don Quai Extract, PEG-8 Stearate, Cetyl Alcohol, Safflower Oil, TEA-Carbomer 940, Squalene, Polysorbate 65, Methyl & Propyl Parabens, Honey, Natural Vitamin E (D-Alpha And Mixed Tocopherols), Niacinamide, Cassia (Cinnamon) Oil, Lepidium Meyenii (Maca) Root Extract, Ascorbic Acid and Fragrance. Aloe Vera: this is a very a succulent species of a plant. Rumor has it that it was originated in Sudan which is a Northeast Africa country. Aloe vera is manufactured and distributed everywhere. There benefits of using aloe vera are amazing for your skin care. When aloe vera gets applied topically, it works fast penetrating the skin deep down inside. Its travels quickly through the many layers of your skin. It will also reach below your skin to your muscles as well and still work effectively. After this, it will continue to even travel past the muscle and eventually get absorbed by the bone! This aloe plant has about 250 different species. 4 of these are grown for the benefits of health and wellness. Aloe Vera Barbadensis is the most grown of aloe species. This particular species is a North Africa native. Aloe vera has been tested on humans and animals alike and it is proven that it will speed a wound. For individuals that've had any dermabrasion treatment, it has also been proven that the damage to the skin improved 38% quicker or more when used. 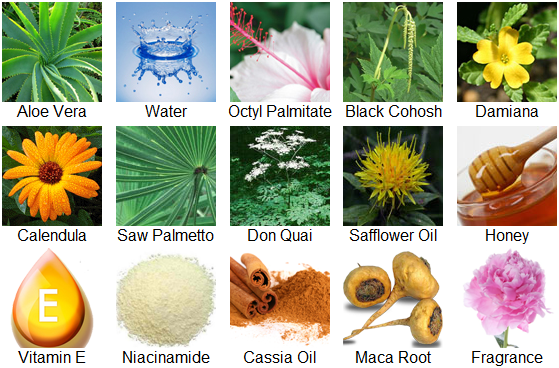 It is widely used for skin care as it works from a cellular level. It will regenerate the cells of your skin and nourish them. Water: a substance made up from the chemical formula H2O. Water is known to help skin retain it's moisture. Water will carry the body's nutrients into the skin so that your skin will get the nutrients it needs. Octyl Palmitate: an ester that is also known as Ethylhexyl Palmitate. This topical ingredient is normally found in personal care products for health and beauty such as body lotions and skin moisturizers. It will coat your skin as a lubricant and give it that smooth and soft look. Black Cohosh: a plant of the buttercup family which is also referred to as Actaea Racemosa. Black cohosh is known to have many unique attributes and helpful to the body's molecular structure. Damiana: a small shrub that will produce aromatic flowers. It is also known as Turnera Diffusa and has been known to be helpful with physical and sexual performance. It widens blood vessels which is a vasodilation effect. This results in the skin being in a state of relaxation while smoothing muscle cells. The primary function of vasodilation is to increase blood flow to tissue in the body that needs it most. Calendula: a genus plant in the daisy family that is a species of annual or perennial herbaceous. For hundred of years people have applied it topically to sooth irritated tissue. Calendula perhaps has the longest history of use of any all natural herb in skin care. Saw Palmetto: an extract of serenoa repens (fruit). This is another ingredient that has been used for many different forms of medicine for hundred of years. It is known to penetrate deep into your body to deliver vitamins, nutrients and more. Don Quai: an herb from the family Apiaceae in China commonly called the "female ginseng". It is also known as Angelica Sinensis. It will increase blood volume, replenish red blood cells and much more. Safflower Oil: this all natural lubricant will act as a security wall to prevent water from exiting your skin. This will help your skin retain the moisture and fatty acids it needs to achieve results. Honey: this is a food substance that is viscous and sweet tasting. It contains no fat and has natural properties that have anti-oxidant and anti-microbial components which protects your skin. It is made from bee related insects. Honey, when applied via skin treatment, will rejuvenate the broken down layers of skin that are depleting. It is also known to leave the skin feeling soft, supple and silky. Vitamin E: scientifically proven as a preventative topical measure from radical skin damage. It renews skin cells by minimizing oxidative stress. It also helps fight wrinkles, fine lines, cellulite and will promote collagen production. Niacinamide: this popular 100% natural vitamin will boost skin cell production. It also assists your skin in retaining the moisture and fatty acids it needs to give you those voluptuous curves where desired. Niacinamide also has been proven to stop certain skin cell pigmentation which minimizes unwanted dark spots. Maca Root: an astonishing super food packed with nutrients, amino acids, minerals, healthy fats, vitamins and more! The healthy fats will store in your curvy areas such as the buttocks, hips and thighs. Maca is an essential component of any effective program. Glutimax is produced and manufactured in an FDA approved facility under strict procedures and guidelines and maintains Good Manufacturing Practices (GMP). This also ensures you are getting a quality product EVERY TIME made up from the finest quality ingredients we've found on earth. Glutimax maintains a 3 year shelf life if stored in a cool, dry and room temperature area. Glutimax is manufactured and labeled in accordance with strict FDA guidelines and procedures. These statements have not been evaluated by the Food & Drug Administration. This product is not intended to diagnose, treat, cure or prevent any disease. RESULTS MAY VARY.